1. Wash, clean and dry the fish pieces. 2. Prepare a marinade by mixing together salt, white pepper powder, fenugreek powder, and turmeric, red chilli powder, garam masala, clove powder, ginger garlic paste, yoghurt, vinegar and cream. 3. Marinate the fish pieces in the prepared marinade and keep aside in a bowl. 4. Make a well in the centre and put mustard oil and cloves in it. 5. Place the live charcoal piece in the oil and cover the bowl with a lid. 6. Seal the lid so that the smoke does not escape. Keep aside for 30 minutes. 7. Remove the lid, skewer the fish pieces and roast in a medium hot tandoor/oven/grill for 5 to 6 minutes. 8. Remove and allow excess liquids to drip off. 9. Baste with oil and roast again for 2 minutes until done. 10. Remove from skewers and transfer to a serving platter. 11. Serve hot, accompanied by a green salad. 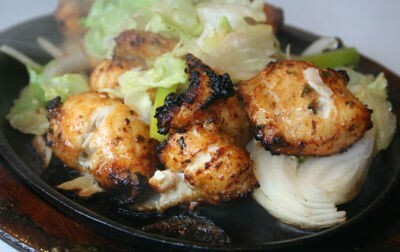 Feel free to comment or share your thoughts on this Saloni Fish Tikka Recipe from Awesome Cuisine.